The European Widgeon is an abundant species and is widespread through both Europe and Asia. The male is a handsome bird with a chestnut head, pinkish breast, and grayish body. 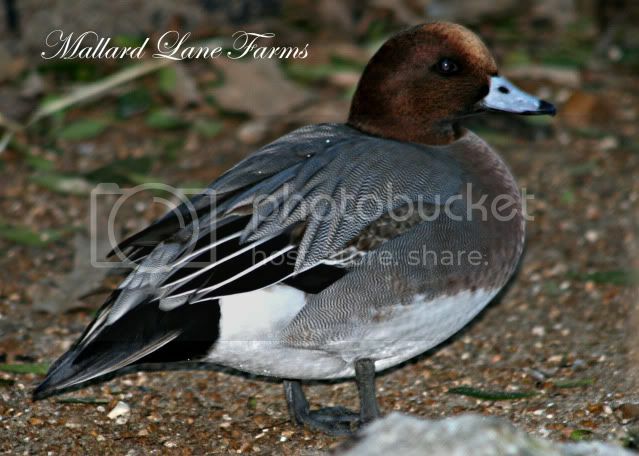 The female European widgeon is a an overall finely mottled brown and resembles the slightly lighter colored female American Widgeon. Like other widgeons Europeans are grazers and in their native habitat they will have an almost completely vegetarian diet. These birds will appreciate an aviary with lots of grass. European Widgeons are not a particularly aggressive species, pairs may show some aggression during breeding season, but they can be kept in a mixed collection. Care should be taken that they do not hybridize with other species of Widgeons. Nesting time is in the Spring, nest are built on the ground in a nest box or under natural cover. Clutches consist on 8-9 eggs which are incubated for 24-25 days. Like other widgeons the ducklings are easy to raise and present no special problems.